San Gabriele d’Addolorata, prega per noi! Some would say this is the end of Gabriel Possenti’s story. His brief life was marked by no extraordinary miracles, his death made no headlines, and perhaps many thought he would rest in a simple grave beside his Passionist brethren until the resurrection. Soon after his death, in fact, the Italian government suppressed all religious Orders, and the monastery where he was buried was deserted. But God has a way of making His loved ones far more well-known after their death. The local people, remembering the holiness of their “Santino” (little Saint), continued to visit his grave. Fr. Norbert, deeply convinced that his former directee was in Heaven, helped to spearhead the process of his canonization. 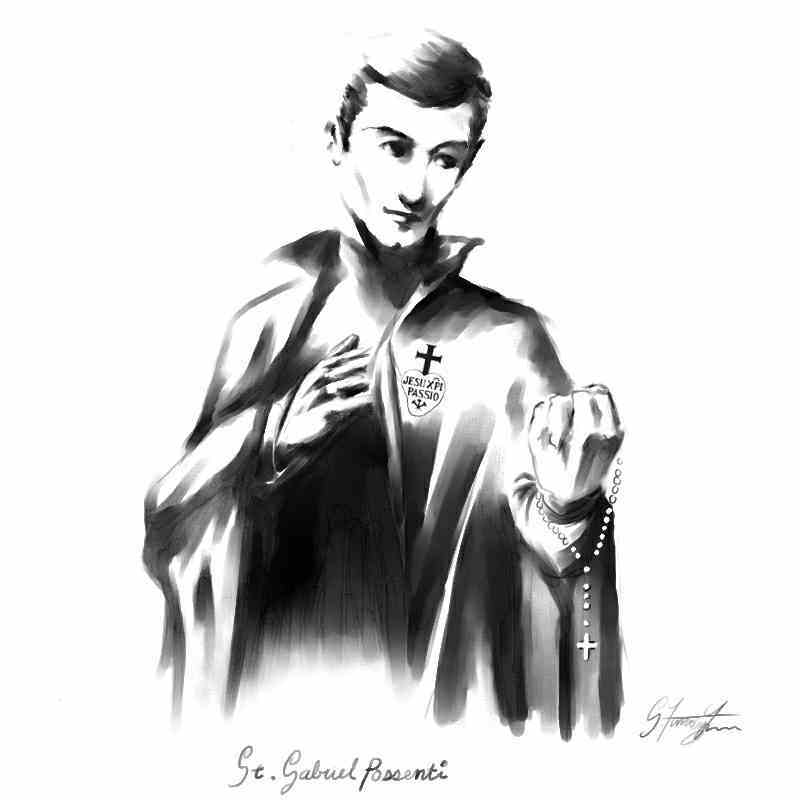 Within 35 years of Gabriel’s death, ninety miracles had been attributed to his intercession! He was beatified in 1908 and canonized in 1920. In 1914 the first great shrine was built in his honor at Isola Gran Sasso; in the 1970s a new sanctuary was built to accommodate the flood of pilgrims. Today, the Shrine of St. Gabriel is one of the largest in Europe, attracting thousands and thousands of faithful – especially youth – every year. Would anyone, meeting the worldly young Francis Possenti, have imagined what he would become? Would anyone from his home town of Spoleto have dreamed that people from around the world would come to venerate him and ask his intercession? Would any of his Passionist brothers have thought the hidden life of this young religious would one day attract such droves of modern young people? In the face of these stunning facts, the message is clear: God can make anyone a saint – and a great saint – if they only strive to be faithful to Him! St. Gabriel of Our Lady of Sorrows, pray for us, that we may follow in your footsteps to become the saints God created us to be!